The box contains just 2 plastic bags and the building instructions which only show the single minifig. So about one page out of 14 is used, with the rest covered in adverts for the other expansion packs. The building instructions for the Companion Cube and Sentry Turret are accessed from within the LEGO Dimensions game itself. The full inventory can be seen here. 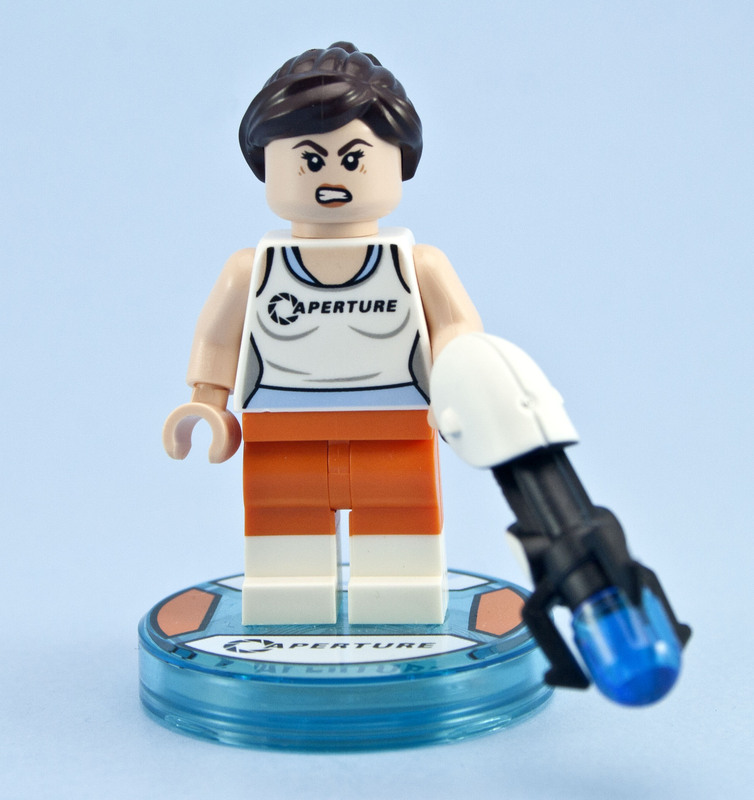 The main character - Chell - has a double sided face, so she can be either angry or merely grumpy. She is unique to this set, but now that LEGO has done one, perhaps there will be more Portal themed sets later on? 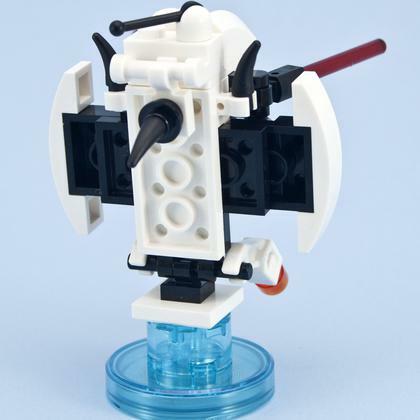 The Portal gun is also unique to this set. 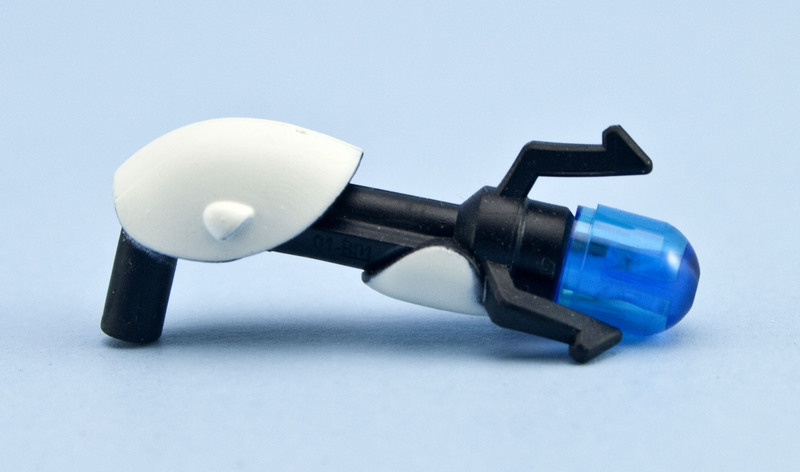 The whole gun (except for the blue bit at the end) is a single piece and made out of rubber. This makes it quite hard to put into her hand, or to move it around once it's in there. It looks freaking awesome though. 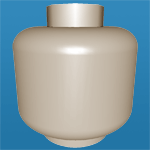 In addition to the minifig, there are a couple of new printed parts. Within the game itself you will find instructions for building the companion cube and the turret gun. There are actually three variants of each, which you can unlock with special gold bricks and buying them with the studs you collect. When you first use Chell to access the Portal 2 world, the console needs to download the contents over the Internet. This took about 2 hrs on my sucky connection so be prepared for a frustrating wait! The actual game includes Wheatley (the annoying grey corrupted core that follows you around making bad jokes), GLaDOS (the neurotoxin wielding test instructor robot), and Cave Johnson (the founder of Aperture Science). And thankfully, all of them are portrayed by the original voice actors. 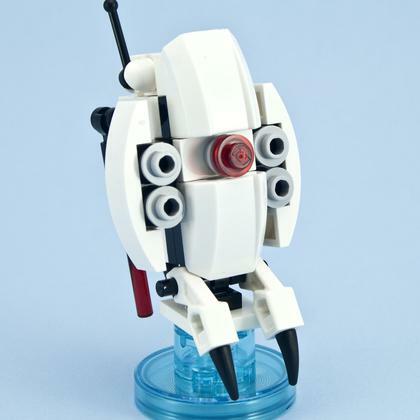 The game does not try to be a sequel/prequel or anything to the Portal games, so you aren't really playing against Wheatley or GLaDOS. It's just a bunch of test chambers for you to have fun in. The original Portal 2 test chambers were quite difficult in places and could leave you extremely satisfied when you managed to solve them. The LEGO Dimensions test chambers are all pretty easy to solve, and nothing that requires careful timing or precision. I suppose it is aimed at young kids, but I wanted more. The test chambers consist of most of the Portal 2 elements: tractor beams, aerial faith plates (with suitable wall-splat animations), blue + orange gels (no white sadly), energy balls, hard-light bridges, and moving platforms. I think I got those names right! 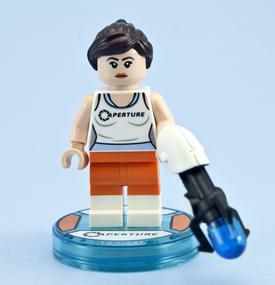 In case you aren't familiar with the franchise, Portal was a game released by Valve in 2007 that grew to immense popularity and a bit of a cult following. 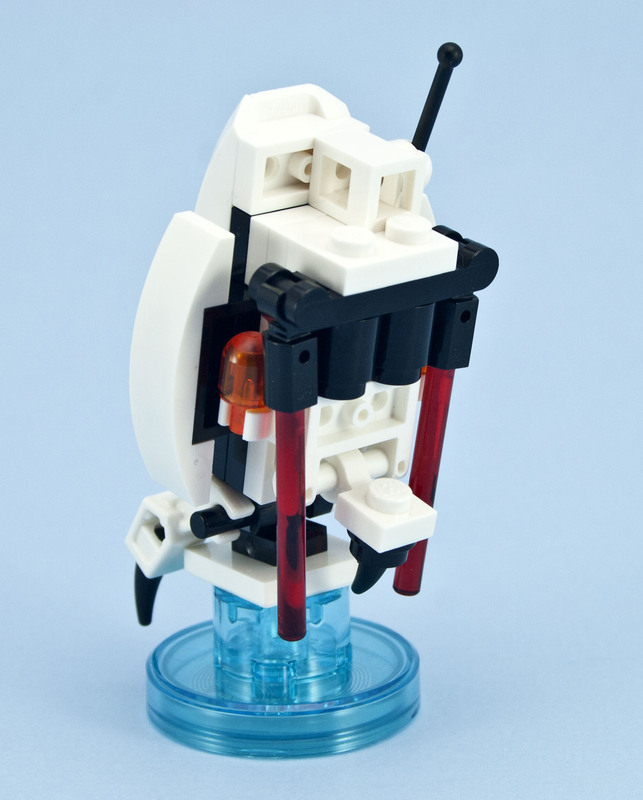 It requires you to solve a number of puzzles using the portal gun. 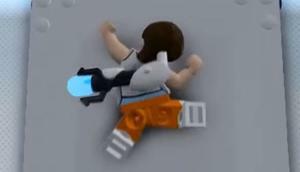 This gun allows you to shoot two portals on different surfaces which links them together so objects can pass from one portal through to the other. 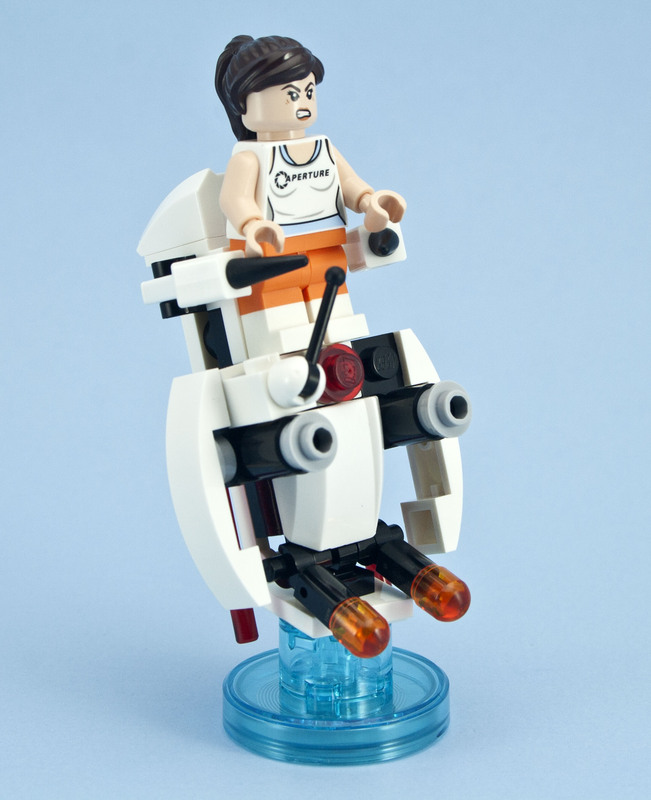 Portal 2 was released in 2011 and was a much longer and more challenging game. It introduced additional puzzle elements and characters which make their appearance in this expansion pack. When placing portals, like the Portal 2 game you are limited to specific surfaces. 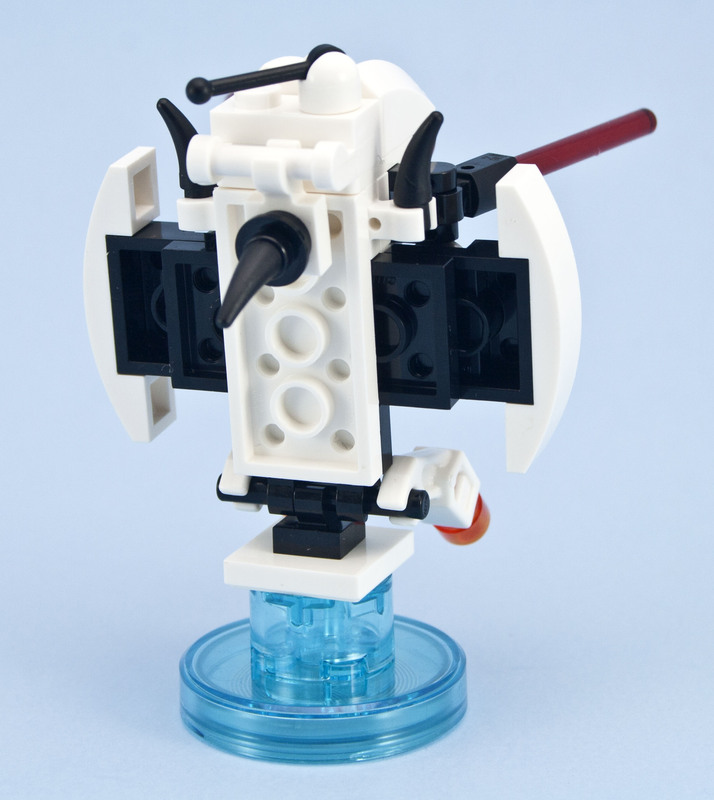 However, in LEGO Dimensions you are restricted quite a lot more and portals will only go in a very few places. You never have to worry about lining things up perfectly, they will just snap into place. 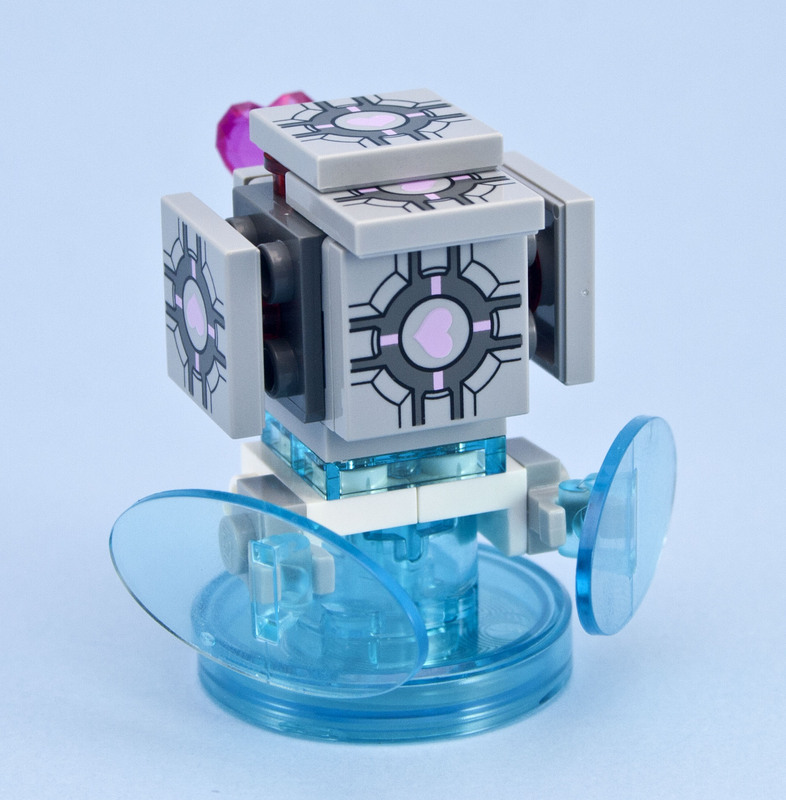 The companion cube and turret gun are required to solve some of the puzzles. By placing them on the base platform they will appear next to your character in the game. You can then pick them up and use them as needed. 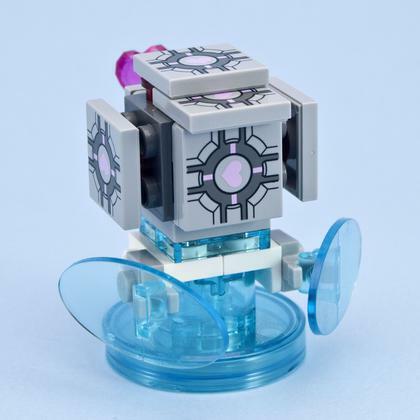 However, if you had already placed the companion cube on a button somewhere in the level and then re-placed in on the platform so it appears next to you, the button it was on will be deactivated. This is actually sometimes needed to solve a test chamber. 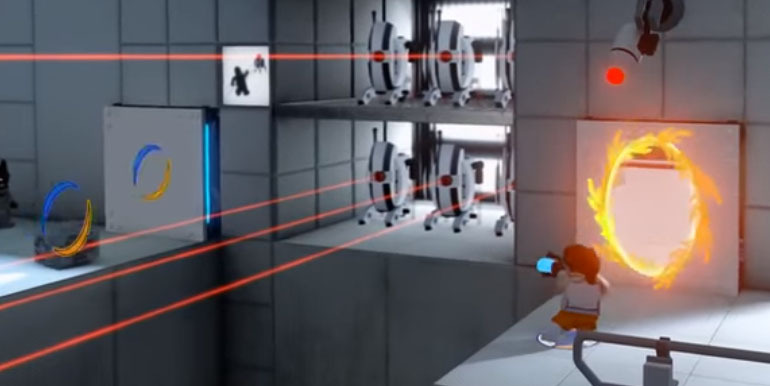 Something that is not seen in Portal 2 are the Turret Switches. To turn these on, you need to use the turret gun item and shoot it at the switch. I guess they needed to invent something for it to do, otherwise it's pretty pointless having it (other than it looking cool!). 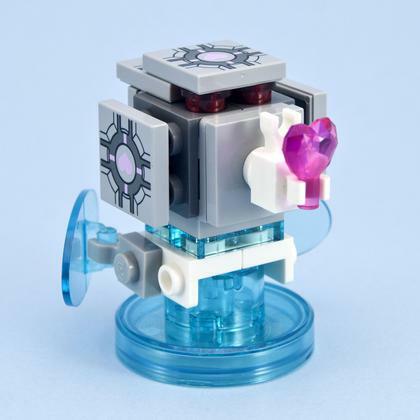 Both the companion cube and turret have three different builds. You have to buy/unlock the later ones, which provide different abilities in-game. 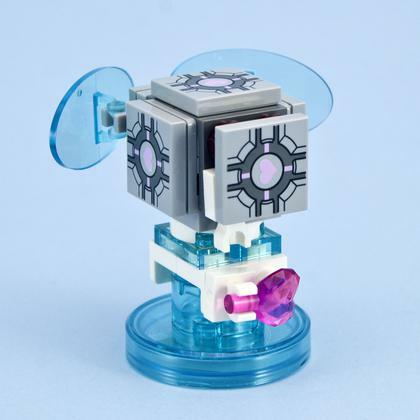 The Sentry Turret is a pretty good representation of the original Portal game. 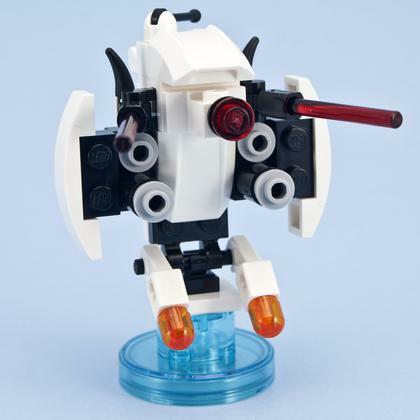 The Turret Striker is a strange looking thing. It's like a Sentry Turret pulled out all its guns at once. It gives you extra abilities to break some types of blocks that otherwise can't be broken - such as Silver blocks and Gold walls. 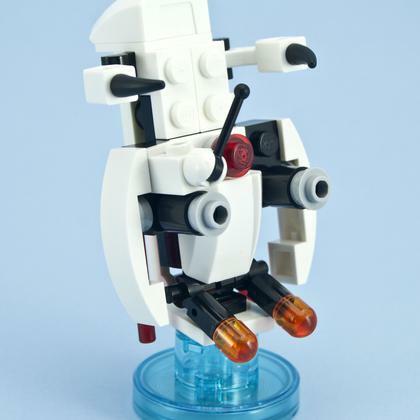 By this level, it's barely resembling a Sentry Turret at all. 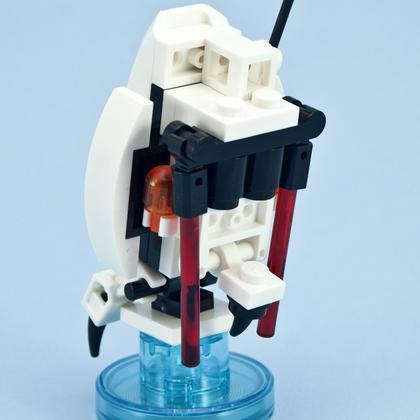 It gains the Flight ability which can be pretty powerful. The main Companion Cube item has a bunch of what seem to be useless components strapped on. Indeed, in the game these do not appear for the level 1 item. They are merely attached here because they are needed for the high level builds. 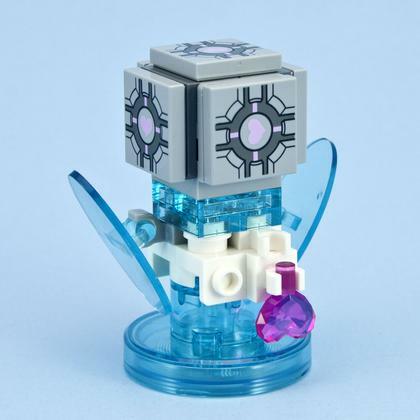 The next level of the Companion Cube adds a new ability. 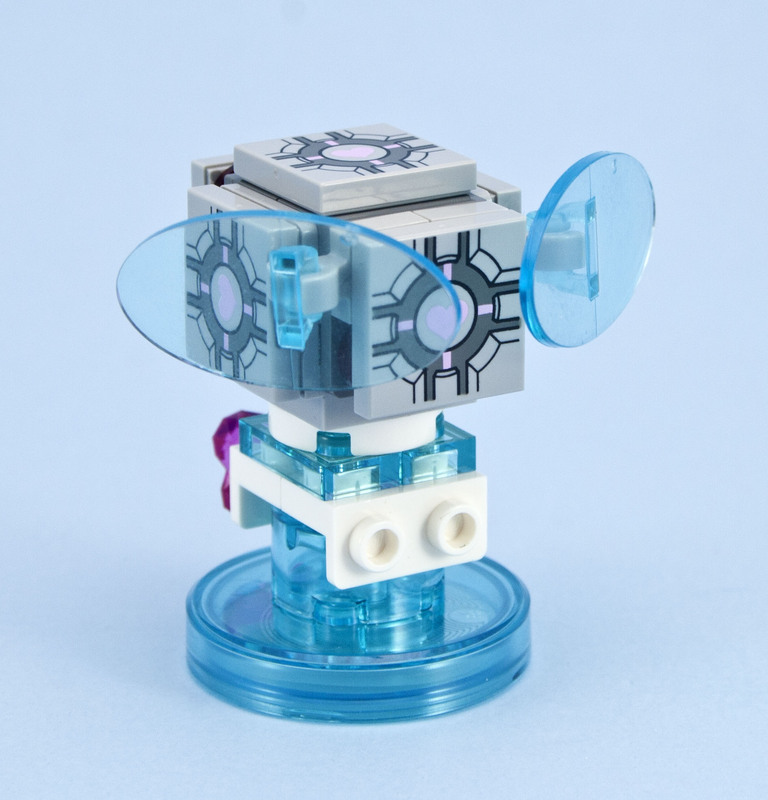 It can now bounce lasers off itself to help you solve certain puzzles. 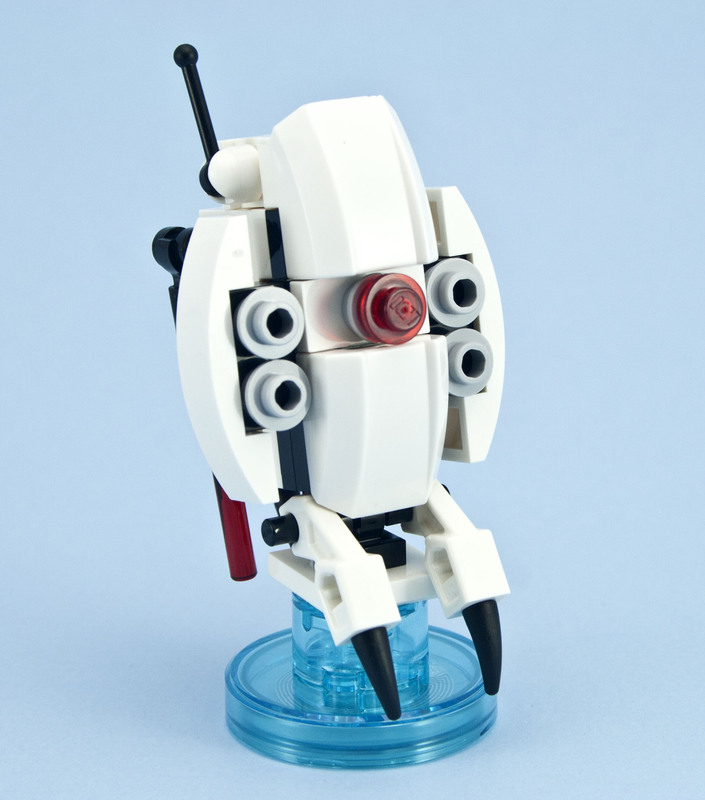 This is not in the real Portal game. 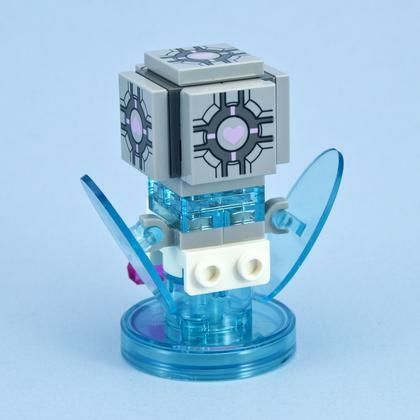 This upgrade to the cube helps all charecters to regain health when they are near it. I don't see the point myself as dying in this game is hardly an inconvenience at all. 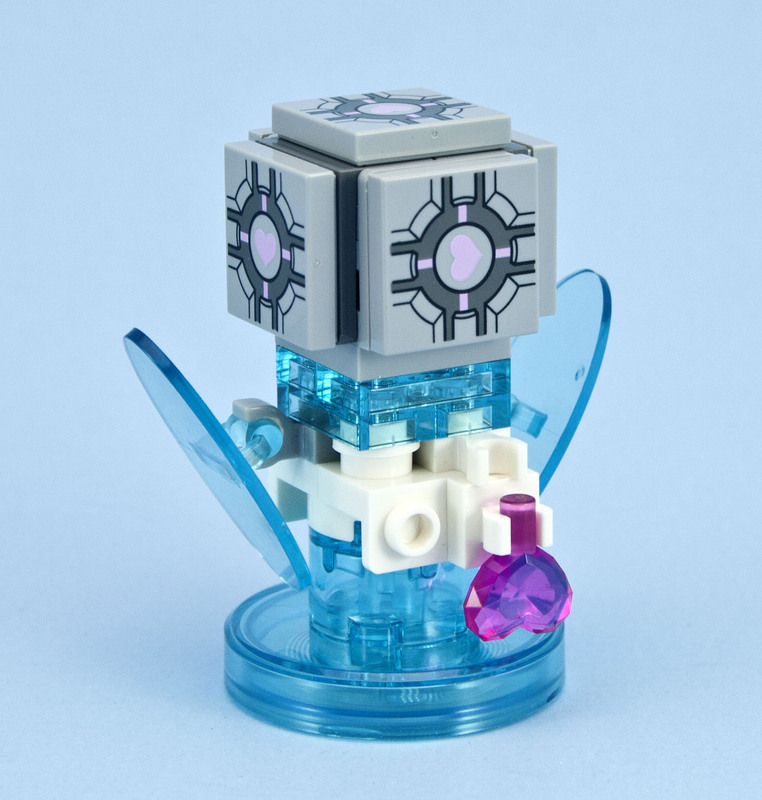 In addition to the main LEGO Dimensions game which includes a Portal world, this level pack consists of 6 test chambers plus a battle against GLaDOS. There are plenty of cut-scenes and a story as you follow Wheatley around beating test chambers. 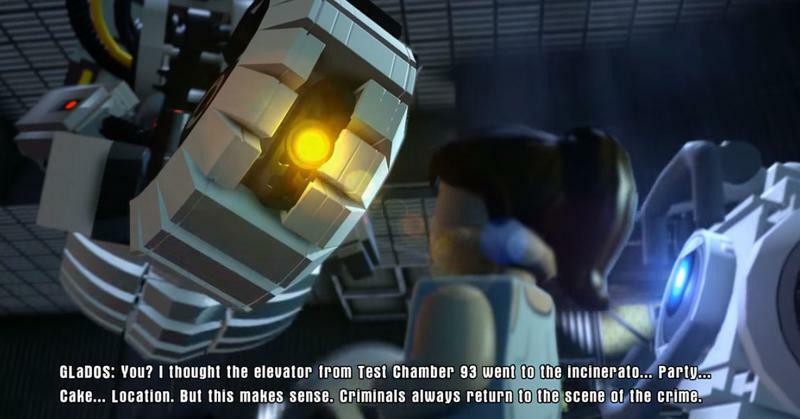 Two of the test chambers are in the old Aperture Science section with Cave Johnson voice-overs and includes the propulsion and repulsion gels. I would have liked more in this area though. 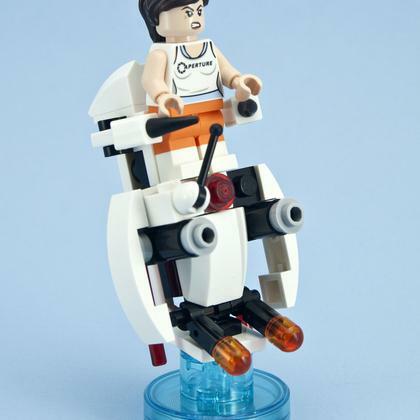 The final battle against GLaDOS has some genuinely funny scenes in it (the space guy is really "annoying"), but like the rest of the game is too easy for my liking. 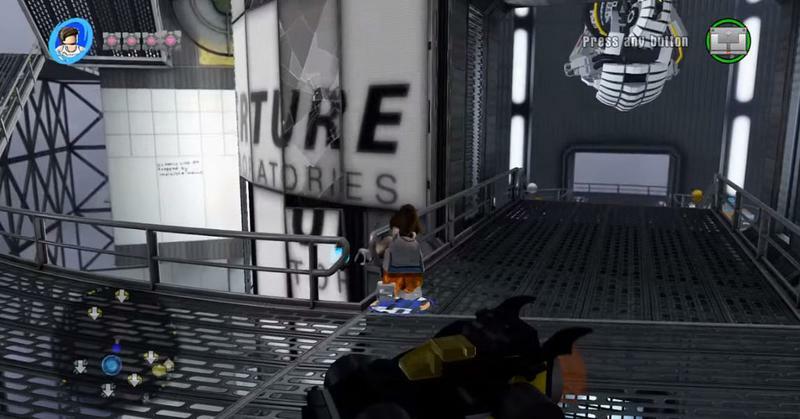 After beating GLaDOS a whole world of extra puzzles and test chambers opens up for you. I was originally thinking the game was ridiculously short, but these extra puzzles help to make up for it. 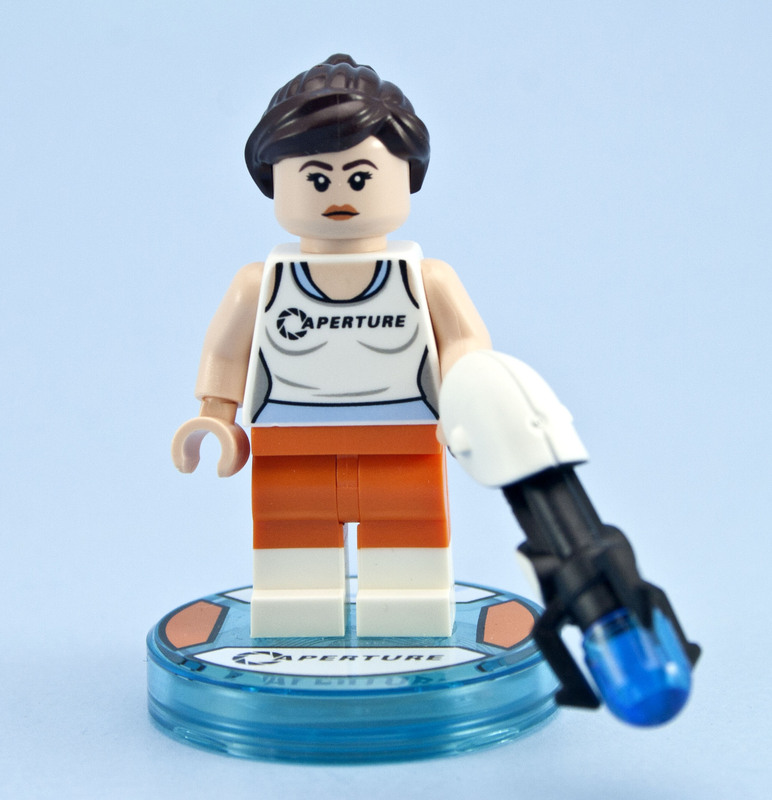 You can access this Portal 2 World from Vorton but only if you have the Chell character. There are four (I think?) extra test chambers that you need to find and gain access to - which in itself is not always easy. 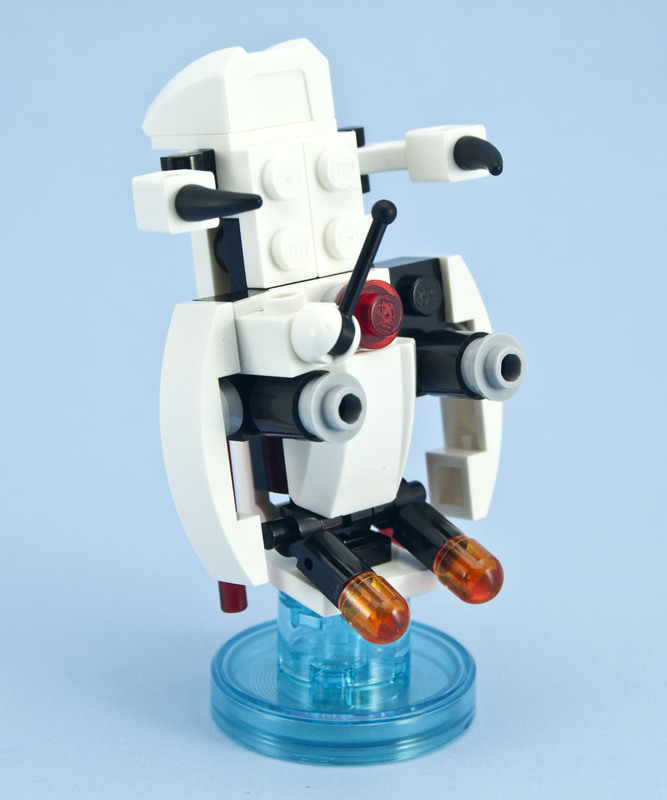 These are definitely harder than the main level pack, and actually require you to use other non-Portal characters (e.g. Batman) to access certain areas. For example, one of the gold bricks is accessible only after using the Cragger Chi character and then the Scooby Snack item which come from two other fun packs you would need to purchase. 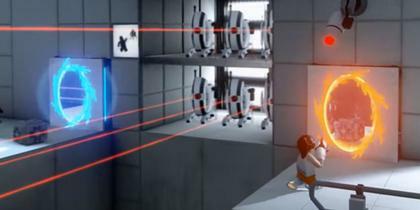 The Portal 2 Level Pack adds several new test chambers to play with, and gives you access to the Portal 2 World.